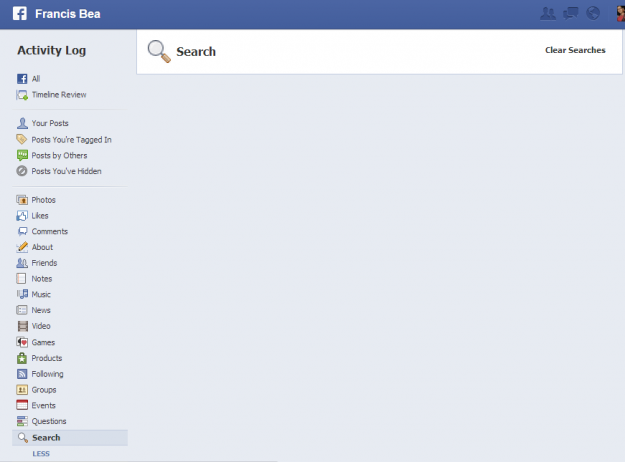 Facebook Graph Search has a nasty surprise waiting for you. 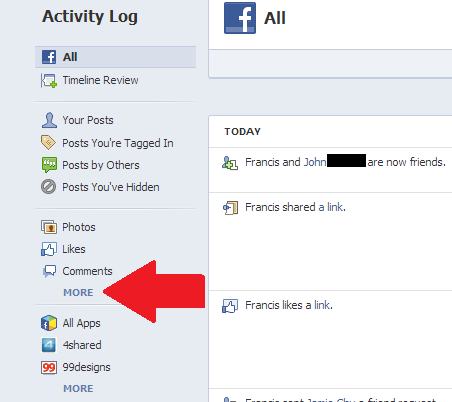 Did you know that you can revisit all of your Facebook searches (and other activities)? These activities are saved in the history of everything you’re doing on Facebook, down to the minute details. In some cases, this data only goes back a couple years or even just a few months – but that’s still terrifying, right? So with Facebook Graph Search rolling out to more users and encouraging searches for just about anything, we’ve got the low down on how to delete this log from ever seeing the light of day. If you click on the “Activity Log” button at the top right corner of your Facebook profile, next to the gear icon, that will take you straight to your Facebook activity page. This is important, so excuse the brief tangent. If you click on the “Include Only Me activity” check box, which can also be found in the top right corner of the Activity Log page, you’ll notice that all of your searches and other activities that are tagged with the lock icon will surface amid your other activities. By default “Include Only Me” activities are by default hidden from your log, including your searches. Now to delete the history of your activities, you can go down through the list and unfriend people, unlike content, and delete posts. Or if you’re just really concerned about getting rid of any traces of the search terms you’ve plugged into Facebook, there’s a one-stop solution for deleting all of your searches in one fell swoop (we’ll get to that momentarily). In the left hand column under Activity Log, click on “More” under where it says “Photos,” “Likes,” and “Comments” to expand and open up additional filter options. At the very bottom of this section above the option titled “Less,” you’ll find an icon labeled “Search.” Click on this. Now we’re almost done. At the top right corner of the page where all of your search terms are listed, you’ll find an option labeled “Clear Searches.” Again click on this option. In case you haven’t found it already, the option can be found just above the month and year. search history, you might want to hear Facebook out – although the decision is ultimately up to you. scratch and probably wont be able to serve better results. But that’s just a minor inconvenience for a peace of mind. If you’ve decided to clear your searches, voila, you’re now done and you should be greeted with an empty search history page that’s waiting to be filled up again. Now you’ll know how to purge your history for next time. Now if you’re really concerned about your privacy, well you can always outright delete your Facebook account for good. These days, Facebook’s habit of using personal data scraped from accounts is reaching a boiling point among users. It’s come to the point where users are noticeably agitated and questioning whether the “free” service is a fair trade for their privacy. If you’re concerned about your privacy, there are three steps you can take. 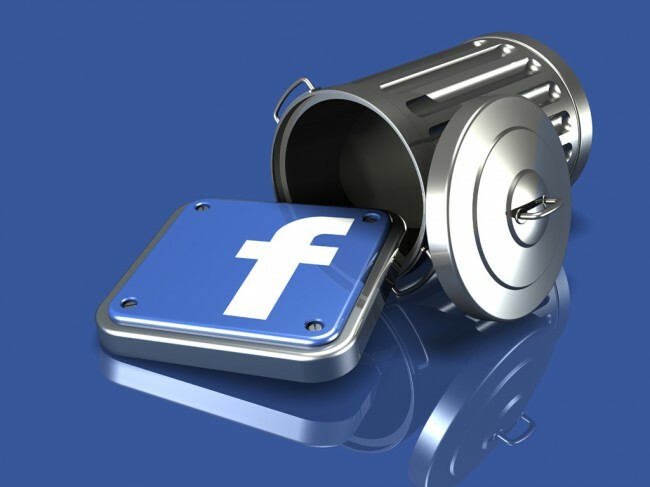 Keep your Facebook profile but remove all traces of embarrassing photos, Likes, and updates; change your content sharing habits; temporarily deactivate your Facebook account; or, of course, delete your Facebook profile altogether. should take to scrub your account. Warning: If you’re dead set on deleting your Facebook profile, there is no turning back after 14 days. 1. Click on the gear icon at the top of the page. Have you connected to a third-party app using your Facebook app? Maybe you’ve signed up with Pinterest with Facebook, or played a Zynga game. 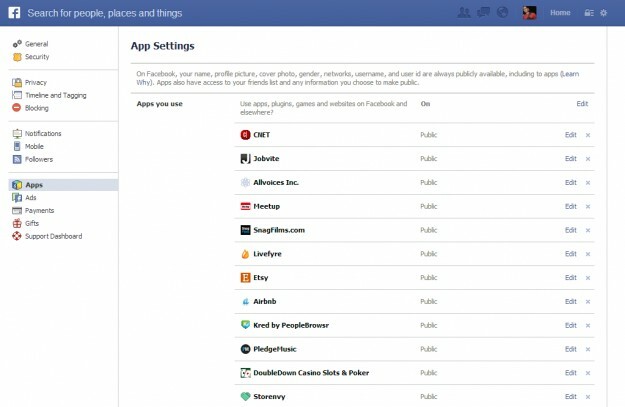 There’s a good chance that you’ve given these apps permission to access your Facebook account. Go through your Facebook account and remove apps that you’ve given permission to to access your Facebook account. The reason for this is that after you’ve deleted your account, Facebook gives you a 14-day grace period to change your mind. If you log into your account, then the deletion is reversed immediately. So if you’re intent on completely deleting your profile, you’ll want to minimize the chance that you accidentally log into a Facebook connected third-party site that’s already logged into your Facebook account during these two weeks. 2. Select “Account Settings” in the drop down list. 3. Click on “Apps” in the left hand navigation column. 4. You’ll see the apps that you’ve given permission to connect to your Facebook account. Click on the “X” next to the apps that you want to remove permanently. whomever managing the email address won’t get to your email right away. 1. First you’ll need to click on this link, “Delete Account,” which will direct you to a page that asks you if you’re certain about deleting your Facebook account. 2. Click on the “Delete My Account” button. 3. Fill out the form that pops up. You’ll first need to enter in your password, and then for security reasons type the captcha into the text box. 5. This is the most important step, and so important that we’re going to restate this step for you. DO NOT log into your Facebook account for 14 days. This includes logging into any third-party app that you may have logged in with Facebook but forgot to log out of.